Bad weather will present fewer problems when Two Rivers Housing needs to reach its tenants in an emergency, following the delivery of two 4 x 4 vehicles. Last year’s heavy snow caused huge issues for operatives trying to reach tenants when their heating broke down, and many of them walked miles in hazardous conditions to reach the people who needed their help. 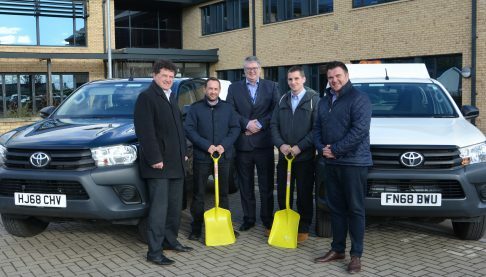 Now the repairs operatives at Centigen Facilities Management – who provide the repairs service for Two Rivers Housing – have two Toyota Hilux four-wheel-drive vehicles available that should help them to reach even the most remote locations when the snow starts to fall. And the timing of their arrival could not have been more perfect – just as snow is forecast in the area over the next few days. “Our staff were brilliant during the heavy snow last year,” explained Centigen’s Operations Manager Gareth Vincent. “Even though the conditions were extremely challenging, they did all they could to reach our tenants, and some of them walked many miles to try and keep the service running and help as many people as they could.